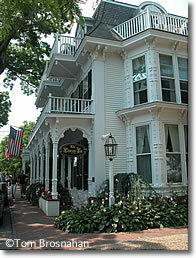 Enjoy Martha's Vineyard	island for a day, overnight, a few days or a week, but you need to plan your time and budget. In high season—July and August—you need reservations for everything: space for your car on the ferry, or for a weekend mainland-to-island flight, or for a rental car on the island, or for a hotel room. You can't reserve passenger space on the Steamship Authority ferry, so the thing to do is get to the Woods Hole docks 15 or 20 minutes early, buy your ticket, and get in line. If the ferry's passenger capacity is reached, the remaining passengers in the line will have to wait for the next boat.